cousin nancy: I Sure Didn't! or Whistler's Mother! I Sure Didn't! or Whistler's Mother! The past few days have been great. Yesterday we ate lunch with our dear friends: Denise & Les and Kris & Jim, at Bella Sera, in Kerrville. As always meeting our lunch club was so much fun and the food was delicious, too. And yes, Tony and I ordered the exact same thing—Lasagne. While we were catching up with each others news, Denise told us about The Good Cop, this great show on Netflix, starring Tony Danza. After Denise reassured me that it was fun to watch and not too violent, etc. I decided to watch it. And omg, I loved it, because trying to solve the murder mysteries was fun. I also loved the father-son humor along with the great cast of characters. Only one thing bothered me while watching the first episode—how much Tony Danza had aged, because I thought I was much older than him when I used to watch him in the sitcom, Friends. In fact, I could not quit thinking about it, so I paused the show and Googled Tony Danza to find out just how old he is, even though I thought he looked great for his age. Or better said, "He's still a hunk to me." When I read that Tony Danza is 67, the same age that I'm fixin' to be in less than 2 weeks, my jaw dropped to the floor. And after I picked up my jaw, I read that Tony, not my Tony, starred in the hilarious sitcom—Taxi. Then it hit me that I was confusing Tony Danza with the great actor Matt LeBlanc. So I Googled Matt LeBlanc and discovered that he is only 51 years old and like Tony, my Tony, he is also a Leo. And Tony Danza is a Taurus. Then I binge-watched the first season of The Good Cop and after telling Tony, my Tony, about it—he binge-watched it, too. Bottom Line: It is a great show and we cannot wait for The God Cop: Season 2 to be released. "Betcha didn't know about this - I sure didn't! I am in awe." Knowing Mari as well as I do, I thought to myself, "Well, if Mari is in awe of this video, then I bet I will be, too. I just hope that it doesn't star Tony Danza or Matt LeBlanc, because then I might get them confused all over again." The name of this IN THE NOW awesome video, is Bird Language. So I immediately went and got Tony, my Tony, to come watch the video with me, because he loves birds so much and he is always taking beautiful pictures of them. First off, let me say that it wasn't exactly about birds like I thought it was. But Tony and I loved watching this video anyway and like Mari—we were in awe too and we never knew anything about this. This video was filmed in a remote Turkish village, with more than 10,000 people using bird language (whistling) to communicate to one another. And their whistling can be heard from miles away, in the mountains. But that is all that I am going to say about it, so you will be just as amazed as us and awed by it, too. Here's the Bird Language video. Late this afternoon, I decided to re-watch this incredible video and after watching it again, I went to go to the bathroom, but on my way there, I stopped when I entered the bedroom, and then went back and grabbed my camera. 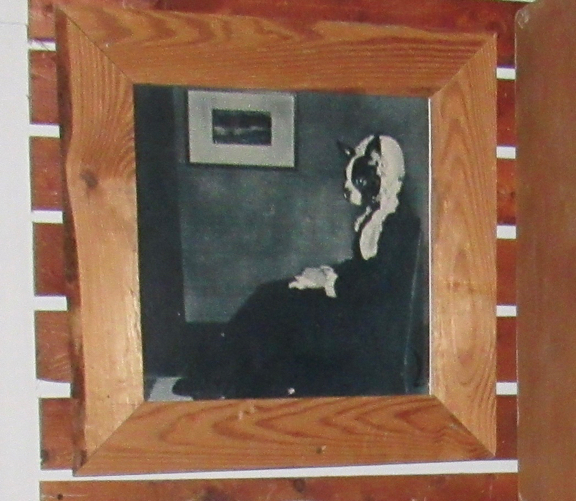 And fortunately for me, Nature wasn't yelling, so I had the time to take this picture of a homemade, framed picture, that I had Photo shopped of my beloved Yoda, back in 1994. Its title is Whistler's Mother (Because whistling is the theme of tonight's post). 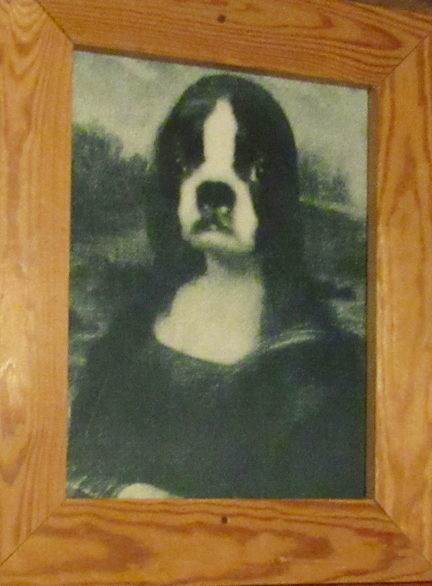 Anyway Whistler's Mother and my Photo shopped, Yoda Lisa pictures, that hang, on the walls, in the bedroom, always make me laugh whenever I see them. And I hope that they will make you laugh, too. Because I believe that no one can laugh enough and it is good for our hearts and soul. An Empty Glass! or Purple Mountain! Am Writing Up A Storm! More Cow Bell! or Ooze Control Tip!